Thailand braces for more globalist backed violence and demonstrations. UPDATE: December 13, 2010. Red shirt leader, globalist stooge Thaksin Shinawatra's invitation by the US's CSCE to "testify" on human rights and democracy in Thailand, was also extended to none other than the International Crisis Group (ICG). ICG has weighed in on Thailand before on behalf of their proxy Thaksin, and are now again involved in this latest public relations stunt. Kenneth Adelman: Former US Ambassador to the UN, former lobbyist for Thaksin Shinawtra, the very man behind Thailand's "red shirt" protesters, the riots, and the ongoing political instability in the country. Wesley Clark: Council on Foreign Relations member, former NATO supreme allied commander. Carla Hills; Council on Foreign Relations member, Trilateral Commission member, signatory of the CFR's "Building a North American Community" aka the North American Union. George Soros: globalist extraordinaire, a personal and corporate member of the CFR. Fidel Ramos: Former President of the Philippines, Carlyle Group member. Zbigniew Brzezinski: CFR member, Bilderberg member, Trilateral Commission member/director/co-founder. What happens when the UK's globalist nexus Chatham House, the US's International Crisis Group (ICG) run by George Soros and Zbigniew Brzezinski, lawyers like Robert Amsterdam, and media giants like BBC, CNN, the Guardian, and the Economist get together to back street protests? Color revolution. The country this time is Thailand. The organization is called the United Front for Democracy against Dictatorship (UDD). The color, red. Red as in Marxism; to represent the rhetorical flavor of UDD intelligentsia like Giles "Jai" Ungpakorn. Ungpakorn is a self-confessed Marxist and believes in turning Thailand into a socialist welfare state, the complete redistribution of wealth, and the destruction of Thailand's highly respected, centuries old culture, history and institutions. He published the "Red Siam Manifesto" within which he places his seal of approval on everything from President Obama, to abortion, to solar power, and frequently has his rantings posted on websites like Socialistworker.org. 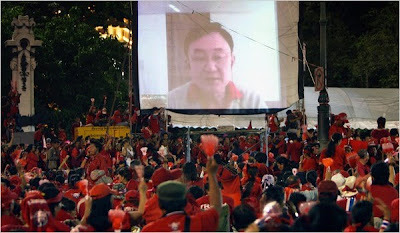 Red as in Maoism; the chosen ideology of UDD leader Dr. Weng Tojirakarn. Tojirakarn is a Chinese trained Maoist who took part in the failed Communist Party of Thailand's fight during the 1960's. He was recently building up a network of political indoctrination camps throughout Thailand's northeast before taking part in violent UDD riots in April and May of this year. He is now in jail awaiting trial on charges of terrorism. Red as in a reflection of Thailand's neighbor Cambodia; ravaged by the Khmer Rogue (Red Khmer), ruled by dictator-for-life, Hun Sen, and being emptied out by foreign investors under the cover of a US trained military and eloquent "people's power speeches." Cambodia has long served as a staging ground and refuge for the UDD and in many ways is a look into the future of a "Red Thailand." And red as in blood in the streets; during April and May of 2010, the Thai military moved in to break up the UDD's protest, in a similar fashion that broke up the same violent protest a year before. Unlike 2009, UDD had provided its protesters with protection from professional mercenaries which assassinated the commanding officer and his command unit and ignited gun battles, arson, looting and rioting that lasted throughout May, killing 92 and injuring over 1,000. The UDD is a centralized "people's power" movement under the leadership of former prime minister, now fugitive Thaksin Shinawatra and his Peua Thai Party (PTP). Thaksin in turn, is currently represented by international lawyer Robert Amsterdam who is also simultaneously providing lobbying services for the UDD. This provides further evidence that Thaksin and the UDD are a packaged deal and not as "grassroots" as the mainstream media suggests. UDD at a typical rally. Amsterdam's firm, Amsterdam & Peroff holds membership next to the likes of BBC, the Guardian, and the Economist in the Chatham House. When BBC, the Guardian, the Economist, and even the Chatham House itself write articles and papers to support Amsterdam's position and overall "regime change" in Thailand, it should be of no surprise. "On the streets of Khlong Toey, the largest slum in Bangkok, there is nostalgia for Mr Thaksin's iron-fisted drugs policy. The 2003 crackdown drove up prices, smashed trafficking networks and forced addicts into rehabilitation programmes. In drug-ravaged communities, where the ends tend to justify the means, that was enough to turn Mr Thaksin into a hero." One can only expect as much from the mainstream media. This wasn't the first Economist article to help bolster Thaksin and his globalist backers' cause. It wasn't even a month after Sam Moon (formally of the Economist) was hired by Thaksin in November 2008 as a lobbyist, that the Economist began printing inflammatory articles attacking Thailand's respected monarchy and lending sorely needed legitimacy to the UDD. Through the mainstream media Robert Amsterdam, Thaksin, and various globalist think tanks like the ICG continue cawing for "international" intervention and mediation, along with elections Thaksin can surely still buy with his political machine, alive and well in Thailand's rural northeast. The globalist media continues portraying the April/May 2010 violence as a one-sided massacre in an attempt to demonize Thailand as an authoritarian dictatorship, while Thaksin and his clique begin to gather protesters for a renewed campaign to seize power. Continued and persistent interest by the globalists in this matter, including their meddling in the mainstream media, and a recent invitation by the US's CSCE, for Thaksin to travel to the US to give "testimony" on human rights and democracy in Thailand, indicate that the color revolution gambit is still on the table. Like all engineered, globalist backed color revolutions, it certainly is not about democracy or social justice. It is about regime change in favor of a known globalist stooge. It is about using crass demagoguery in order to divide and tear down the strength of a sovereign people. To specifically attack the Thai Monarchy as Giles Ungpakorn and the Economist have is to debase one of the few common grounds all Thais share and have shared for centuries. A divided, infighting nation with a damaged culture makes an easy target for globalist foreign investors who are clamoring at the borders of yet another nation, ready to insert their parasitic probosci and empty the country out. And while dangers exist within the current Thai government of a slower integration into the globalist collective, the immediate most unhinging threat is a third attempt at reinstalling Thaksin Shinwatra into power on the back of a violent "people's army." What is most unsettling of all, is that the latter is providing a distracting cover for the former.